application and workload migration to the cloud. Establishing reliable and secure network connectivity for these hybrid use cases presents a challenge to most teams. Imagine one specific example: you have a critical internal web application hosted in remote offices around the globe as well as in AWS. In order to provide fault-tolerance for the application, you would like to setup a central load balancer that balances traffic between the remote sites and AWS. 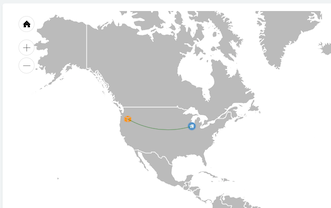 AWS recently released the Network Load Balancer that made this possible by adding the ability to specify an IP address as a load balancer target, in addition to instances. However, using the NLB to forward traffic to a target IP address outside of AWS will only work if you have Direct Connect between the remote site and the AWS region. An IPSEC tunnel built between AWS VGW and on-prem site does not work since in this case traffic is always initiated from the VPC. So, for most users this doesn’t help. Aviatrix solves this for AWS customers without Direct Connect. In this document, we will demonstrate how to go from an empty AWS VPC and a remote, on-premise hypervisor to a working demo that balances web traffic between the two sites. This demo will involve two web servers hosting a basic website. 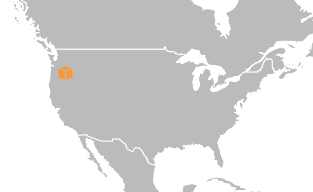 One server will be located in a remote site and one will be hosted in AWS. We’ll set up AWS’ NLB service to listen on port 80 and configure both of these servers as targets. The webdemo hostname has been registered in DNS pointing to the NLB. 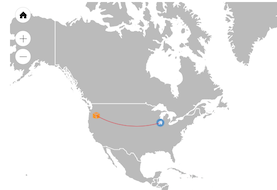 When a user accesses the demo site (webdemo.aviatrix.com/index.html) from a browser, that request will be handled by the Network Load Balancer (the orange line in the diagram). The NLB will choose either the green route to the remote site or the blue route to the EC2 instance and the selected web server will respond to the user with the contents of the requested file. For the purposes of this demo, the contents of index.html will differ slightly on each server to include either “Welcome to the Data Center” or “Welcome to AWS”. 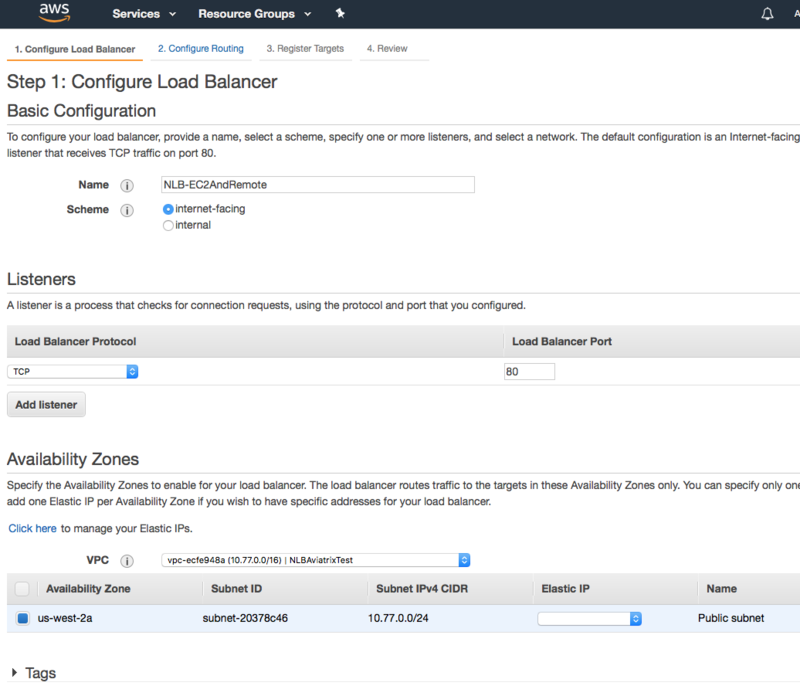 For AWS, we’ll create a new VPC, EC2 instance, and enable the NLB service. 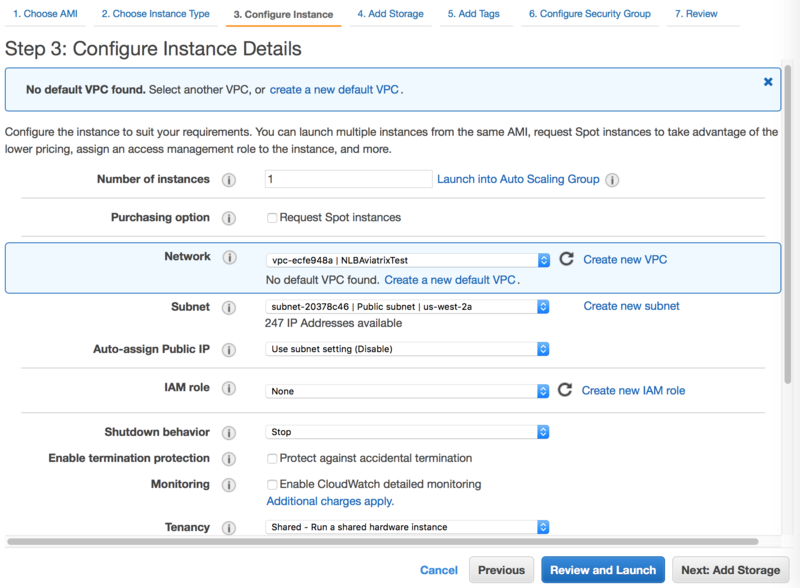 There are a number of ways to create a VPC in AWS. 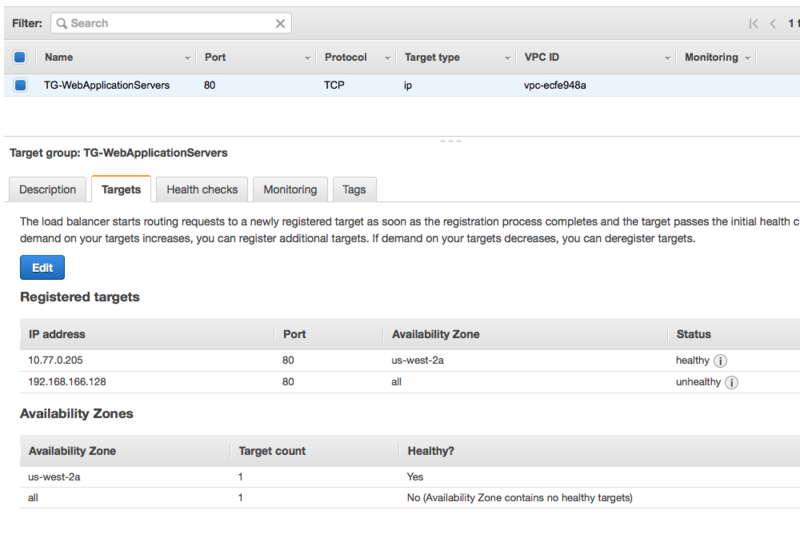 We’ll use the VPC Wizard, available in the VPC Dashboard. Click the Start VPC Wizard button to launch the wizard. 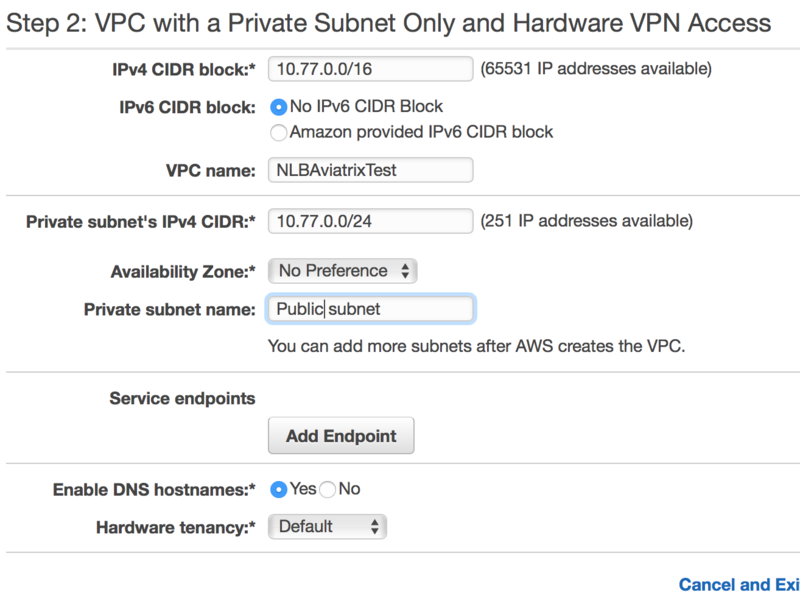 Then, select the VPC with a Private Subnet Only and Hardware VPN Access option. Finally, fill out the form that follows providing an appropriate CIDR block and VPC name. Connect to the new instance via SSH. We temporarily associated an Elastic IP with this instance for convenience while configuring it. In the next step, we’ll set up the NLB to route traffic to this instance so we will no longer need the EIP associated with this instance. On Step 1 of the form that is displayed, give the NLB a name and select internet-facing for the Scheme. We’ll only need one listener on port 80 for this demo, so the default configuration is sufficient. 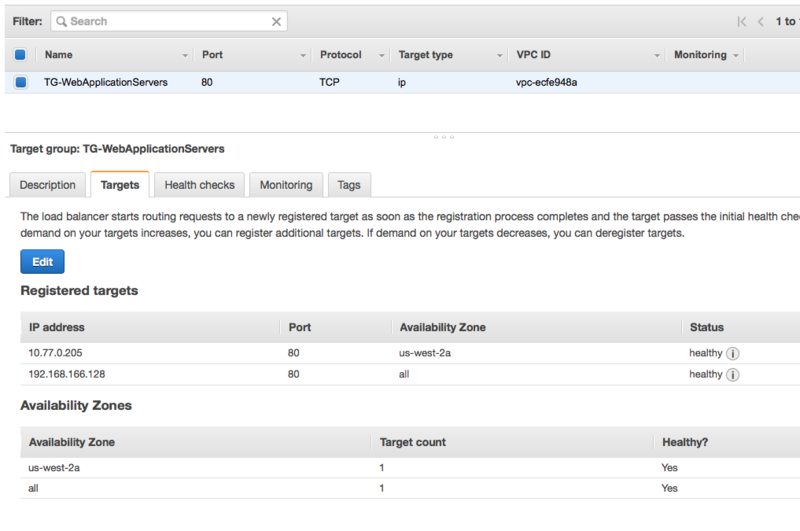 Under Availability Zones, select the VPC we created in step 1a and then check the only subnet in the table below that. On Step 2, select New target group0 and provide a name. Be sure to change the `Target type to ip instead of instance (we’ll rely on this configuration later when accessing our remote site). Everything else will remain the default. Step 3 requires us to select our target(s). For now, we only have one (our Linux EC2 instance that we created in the previous step. In the IP field, type in the private IP address of the EC2 instance that was created earlier. Keep the default port of 80 in the Port field and then click Add to list . Review the configuration and click Create . Give the Load Balancer a few minutes to move out of the provisioning state into active . 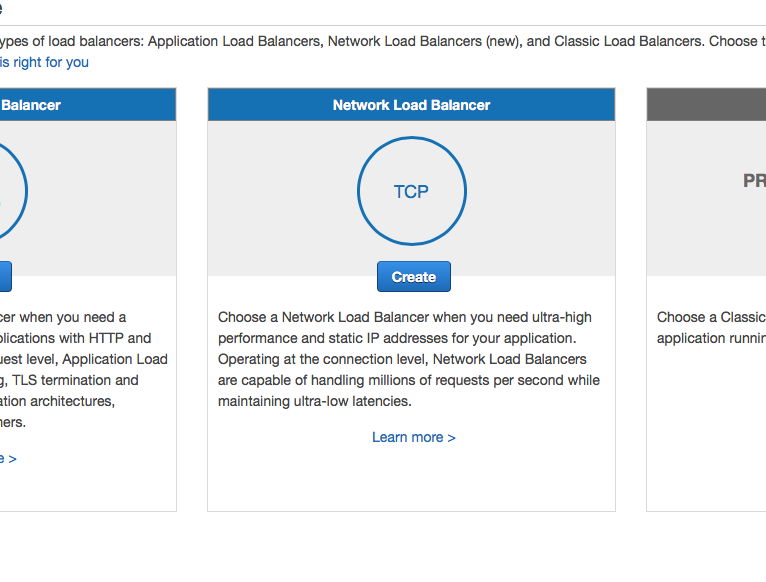 Once active , open a web browser and go to the public DNS name of the new load balancer. The remote site can be any network not in AWS. For this demo, I’ve provisioned an Ubuntu VM with Apache on my laptop’s VMware Fusion environment. 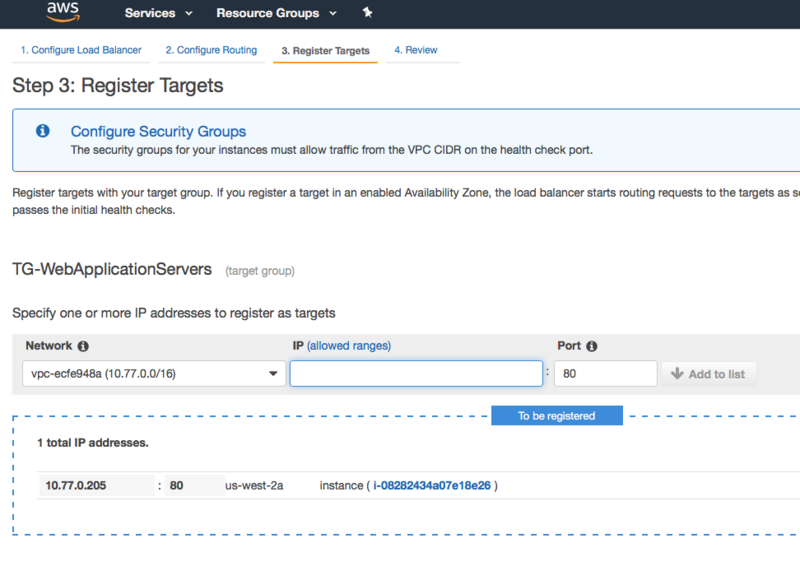 Without a Direct Connect connection between the remote site and AWS, you won’t be able to add this new VM to the NLB. However, Aviatrix can overcome this requirement with a few simple steps. 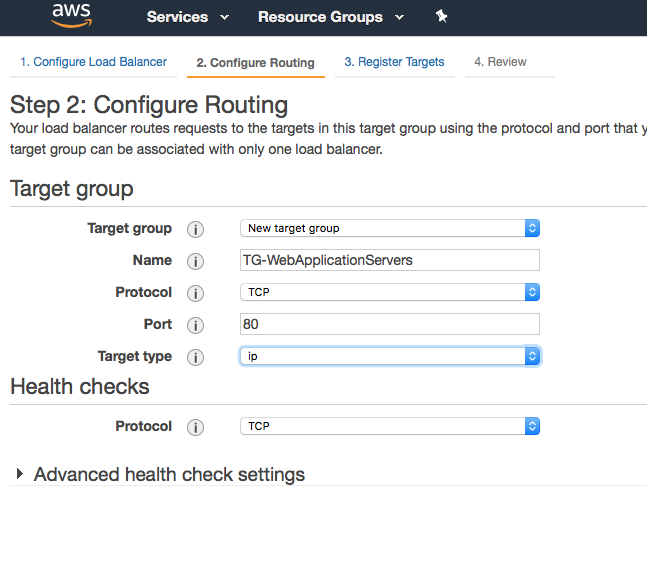 Follow the installation instructions to get a Controller up and running in AWS. Once complete, open a browser and connect to the controller over https (https://<controller ec2 public IP>/). Login with the username admin . The password is the controller’s private IP address. Follow the prompts to enter your email address and click Run when prompted to upgrade the Controller to the latest version. Finally, create an Aviatrix Controller account. You’ll use this to login to the Controller. Aviatrix recommends selecting IAM role-based option for AWS access. 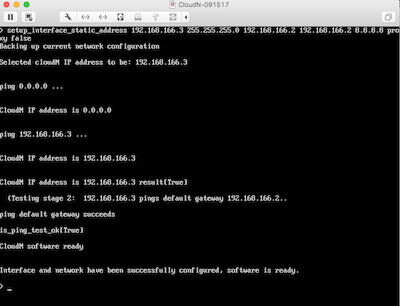 Next, follow the instructions to install an Aviatrix Gateway in this VPC. This will be where our remote site will connect. Our final step is to add an Aviatrix Gateway at our remote site. Aviatrix provides a virtual appliance that can be downloaded from here. Download the appropriate appliance for your environment and spin up a VM. Once complete, open a browser and browse to the IP address you just configured for your controller. 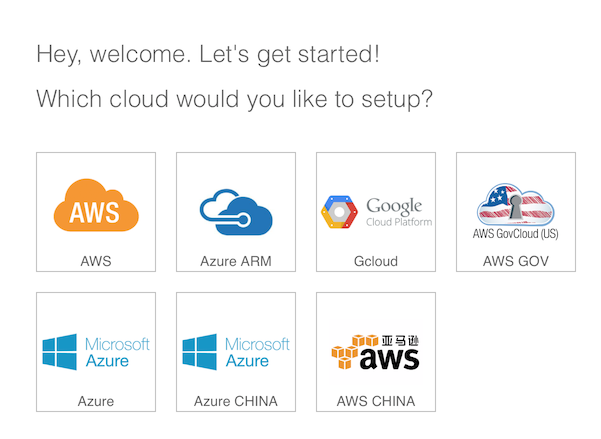 Follow the same initial steps as you did for the cloud (AWS) Controller. Once you get to Step 2 Datacenter Extension or Site2Cloud , stop and click on the Site2Cloud icon on the left. 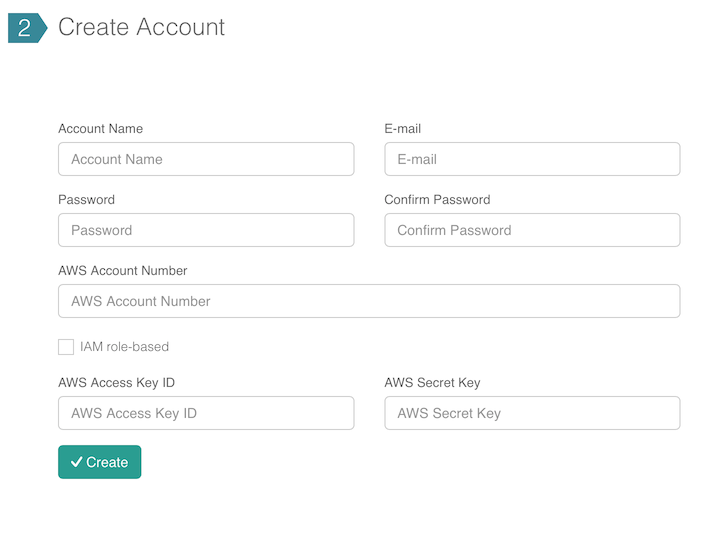 In a separate browser window, log into the Aviatrix Controller hosted in AWS. Click on the Site2Cloud icon on the left and click + Add New button at the top. 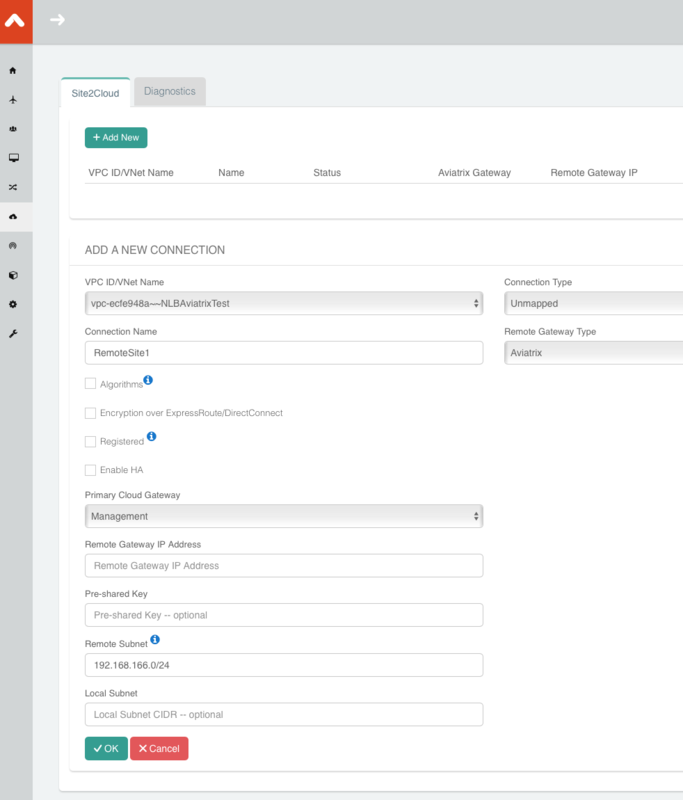 Select the correct VPC, enter a Connection Name, and change the Remote Gateway Type to Aviatrix . Finally, provide your edge router IP address for the Remote Gateway IP Address and populate the appropriate Remote Subnet. Then, click OK .
Once complete, select the connection from the table you just created. Click Download Configuration (NOTE: you may need to disable the popup blocker in your browser). Once downloaded, go back to the browser window with the Aviatrix Controller in the remote site. You should be on the Site2Cloud page. Click + Add New at the top. Then, scroll to the bottom and select Import . In the file open box, select the configuration downloaded in the previous step. Once complete, switch to the Aviatrix Controller hosted in AWS and go to the dashboard. You should see the 2 sites connected but with a red line. Once the link is established and the line representing the link turns green, we are all set. One last step that we’ll need to do is to tell the default gateway on the subnet where Aviatrix gateway is deployed that the next hop is the Aviatrix Gateway for traffic in AWS VPC private IP address range. The steps to make this change will depend on your individual router. You’ll need to route all traffic destined for the AWS VPC private IP range (10.77.0.0/24 in my example) back to the Aviatrix Gateway. 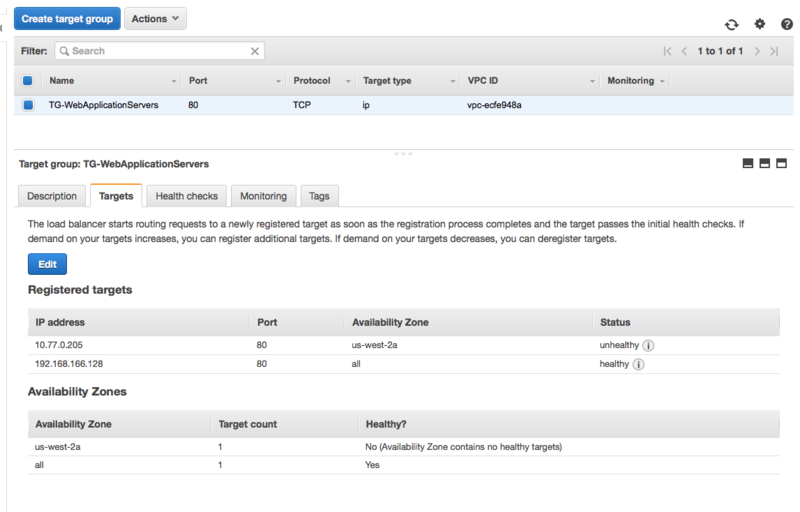 Back in the AWS console, go to the Target Groups in the EC2 Dashboard. Click on the Target Group we created earlier and then click on Targets . You should have just one IP in the list right now. Click Edit and then click on the + icon at the top. Change the Network drop down to Other private IP address and then enter the private IP address of the Ubuntu Apache VM we set up earlier on the remote side. Click Add to list and then Register . Once the remote VM is registered, verify that the NLB shows both targets as healthy . It may take a few seconds for the newly added IP to move from initial to healthy . After both target IP addresses are healthy , we are ready to test. 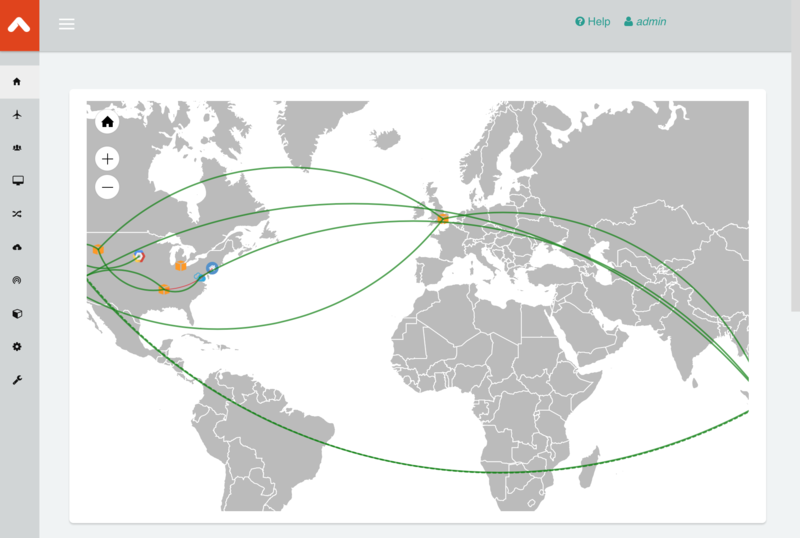 Aviatrix makes balancing load between AWS and remote sites easy. But that’s just the beginning. Aviatrix makes cloud and hybrid networking as simple, dynamic, and disposable as compute and storage. Read more about Aviatrix here.